June 15, 1920 The June meeting of the W.B.J.U. met the third Tuesday of Jun at the Congretionals [illegible]. The secretary being absent Miss Harriett Buck acted as secretary pro term. Mrs. Wordburn had charge of the devotional, [illegible] of singing scripture reading and prayer. The secretary being absent Miss Buek acted as see pro term. Secretary report read and approved Treasure. 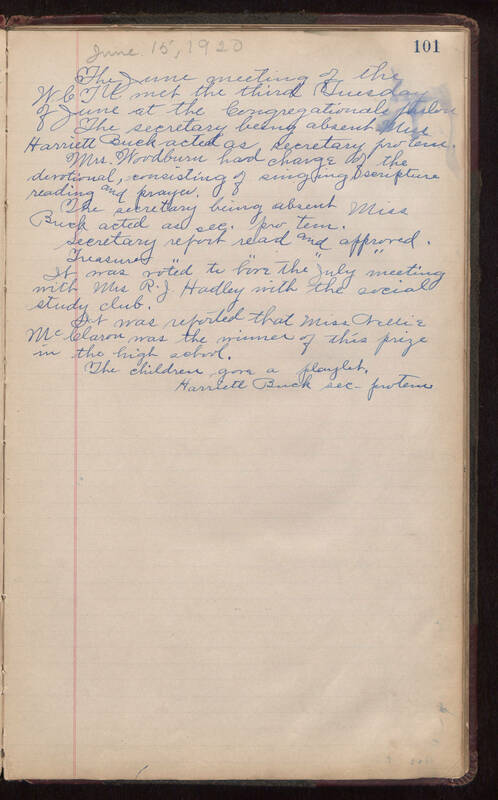 It was voted to [illegible] the July meeting with Miss R.J. Hadley with the [illegible] study club. It was reported that Miss Chellie Melelarou was the winner of this prize in the high [illegible]. The children gave a [illegible]. Harriett Buck see - pro term.